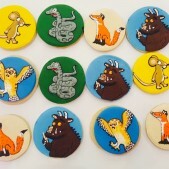 “But who is this creature with terrible claws, And terrible teeth in his terrible jaws?” The Gruffalo is one of our own personal favourites! 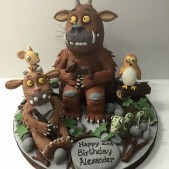 There’s something special about The Gruffalo and The Gruffalo’s Child that ensure we receive a constant stream of requests for birthday cakes with the much-loved purple prickled creature to cater for all budgets and sizes. 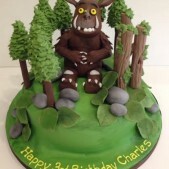 With so much detail to capture on the cake, a Gruffalo cake is always the centrepiece to any birthday. 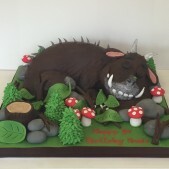 Maybe it’s the intricate detail in the purple prickles all over his back or the knobbly knees and turned out toes? 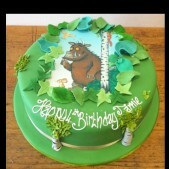 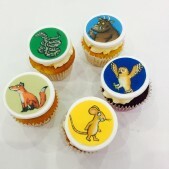 Whatever it may be, having celebrated the 15 year anniversary of The Gruffalo we definitely think it’s here to stay. 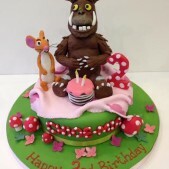 Cakes by Robin can create Gruffalo transfer cakes all the way up to magnificent 3D hand-crafted designs complete with sugar models of snake, fox, owl and all the woodland creatures. 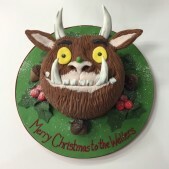 Our professional sugar-craft experts are passionate about ensuring every single Gruffalo cake that is created is as realistic to form as possible!